A very good option when there is not any green veggie in ur fridge & u r in mood to cook & have a delicious curry for ur lunch/dinner. Mix properly all ingredients of pittod in a bowl . Heat a deep non-stick pan & pour pittod batter in it. Stir continously on sim flame for 5-6 minutes till it thickens & starts leaving pan. Immediately pour & spread it thinly on to greased steel plate. cut it into squars of 1"x 1" & keep aside the ready pittod. Grind all ingredients of gravy except oil, curd & coriander leaves. Heat oil in a heavy bootom pan & add ground spice paste to it. Cook on sim flame sttirring occasionally till oil separates. 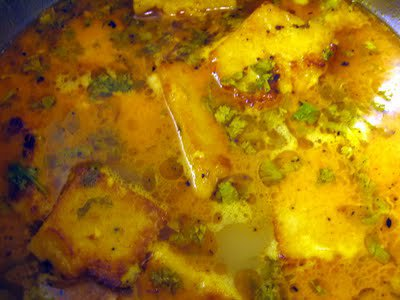 Now add beaten curd & stir it immediately. Cook again on medium flame till oil separates & mixture dries up. Now add 1-1/2 cup water & bring to oil. Add prepared pittod cubes one by one to he boiling gravy. Cook on sim flame for another minute. Garnish wid coriander leaves & serve hot with chapatis.